There are plenty of mattress stores in Jacksonville, from giant national retailers to mom-and-pop mattress shops. Value rules in this city; folks in Jacksonville are discerning shoppers, and never pay full price when they don’t have to. You won’t find a lot of trendy mattress shops or too many sleep gadgets in this market, but you will find a lot of shops offering high quality products at low prices. That bottom-price competition is great news for folks who are deciding where to buy a mattress in Jacksonville. A little comparison-shopping can yield a great bargain, even on a specialty item like a cool-gel mattress or adjustable air bed. If you’re wondering where to buy a mattress in Jacksonville near your neighborhood, read on. 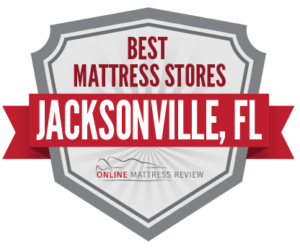 We’ve combed the reviews to bring you the best-rated mattress shops in Jacksonville in each area of the city. Buddy’s Home Furnishings (8807 Lem Turner Rd) specializes in rent-to-own electronics, appliances and furniture, but is also an great place to buy an affordable mattress in Central Jacksonville. Sealy and Corsicana rule at Buddy’s, though the store also carries a few Sierra Sleep and Noctova products as well. Rent-to-own rates for buying a mattress are reasonable; you’ll pay between $15 and $25 per week for most models, and you can select a higher weekly payment if you’d like to own outright sooner. Just a few doors down, Aaron’s (8853 Lem Turner Rd) is another electronics, furniture and affordable mattress store. Like Buddy’s, this is a great place to buy a mattress if you’re looking for a no-credit-required option and flexible payment plan. This store carries a small selection of Simmons and Woodhaven mattress sets, and offers free delivery and set-up. Still another nearby option is Badcock Home Furniture & More (6521 North Main St). Like the previous two, Badcock is a furniture, electronics, appliance and mattress shop, and offers serious discounts on name brands, as well as flexible financing. A large number of 5-star reviews attest to this furniture and mattress store’s great quality and low prices. Across the river, Beds Beds Beds (9843 Beach Blvd) gets top marks for outstanding customer service, with knowledgeable, helpful and laid-back sales associates. This mattress shop has a large showroom, with name brands likes Simmons, Sealy, and Serta, along with quite a few value brands. Nearby, JaxMattress (6285 Powers Ave) earns rave reviews for low prices. The owner operates a one-man mattress shop, with now employees or advertising, and passes on great savings to the public. The store even has toys on hand to keep kids entertained while parents take their time browsing the wide inventory of affordable mattresses. Mattress Firm Jacksonville North Estates (840 Nautica Dr) is located in the River City Marketplace. This reputable chain is known for having a wide selection of popular mattress brands. About a mile south, Jacksonville Furniture Mart North Clearance Center (11815 North Main St) sells furniture for the whole home, along with name-brand mattresses. Customers give props to this outlet for value, and many advise negotiating- especially when buying multiple items- to get the best-possible deal. Another well-reviewed furniture and mattress store in Jackson up north is Mattress and Linen Depot (3000 Dunn Ave). As the name implies, the store sells bedding and beds, as well as furniture and mattresses. Value is good but selection is limited, making this a good place to buy an affordable mattress if you’re in the market for a full bedroom set and flexible as to your mattress’ brand and style. Jacksonville Furniture Mart has a second location (9230 Atlantic Blvd) in Jacksonville’s Southside, where the selection is a bit wider and more consistent than at their clearance store to the north. AA Beds (3740 St Johns Bluff Rd South) is more of a warehouse than a showroom. Mattresses are piled high in this large space, but customers report that the friendly and knowledgeable sales associates are able to steer you to the right mattress- without a heavy sales pitch. This mattress shop stocks a good selection of products with the latest comfort and sleep technology, such as cooling gel. Way down in the Southside, Sweet Dreams Bedrooms Direct (11018 Old St Augustine Rd) is “worth the trip,” according to multiple reviewers, who swear by the low prices in this discount furniture and mattress store. Sweet Dreams charges a small delivery fee, or will provide a “safe, secure and legal tie down” for free to those customers who’d prefer to drive off with their new purchase. Mattress Firm is, hands down, your best bet when looking to buy a mattress in Jacksonville on the East side. The store has three locations in the area: Mattress Firm Atlantic West (11806 Atlantic Blvd), Mattress Firm Sans Pareil (11840 Beach Blvd), and Mattress Firm Regency (9327 Atlantic Blvd). This national chain is America’s #1 retail mattress store, and sells a wide selection of branded mattresses, including specialty options like gel memory foam, pocketed coil and pillowtop models. All three locations earn great reviews for their cheerful and professional sales staff. Mattress Firm sales reps (aka “sleep experts”) are trained to steer customers to the best mattress for their comfort preference and budget, and can also reccommend specialty mattresses to address issues like back pain and sleep apnea. Adjustable Beds By Bob Hazouri (4114 Herschel St) wins top marks with customers for its specialty adjustable air mattresses, with many noting that the prices at this mattress shop are half those of its main competitor, Sleep Number. This affordable specialty mattress shop will not only deliver low priced, high-tech mattresses and beds, but the staff spends time with each customer showing them how to adjust and maintain their new purchase. To the north, shoppers can also browse the selection at Factory Mattress Outlet (5335 Lenox Ave), a locally-owned, no-frills mattress store that’s well-suited for bargain hunters. About a mile further down I-10, Wayne’s Fine Furniture & Bedding (5853 Normandy Blvd) is another local option. This mattress store has been in Jacksonville since 1969, and sells a wide variety of memory foam, hybrid, adjustable and traditional mattresses, as well as an astonishing variety of recliners. This family-owned business has earned a great reputation over the years for honesty, responsiveness and providing individual attention to customers. Further to the south, customers can score a bargain at Mattress1One (8181 Merchants Gate). This small-chain mattress store offers a 180-day in-home trial, free delivery and a price-matching guarantee. Check their website for specials, reviewers advise, as they run frequent sales.